Being a client-centric organization, we are engaged in trading Stone Watches. Owing to our rich expertise, we manufacture and export a wide range of wooden stone watches. These are perfectly suitable to be gifted in corporates. These products are intricately carved and are available at market leading prices. Our clients can avail from us Watch GP Stone, which is used in homes, offices and commercial establishments. These decorative items are widely appreciated in the market for excellent design and fine finish. 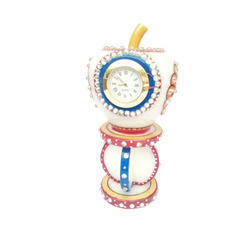 Our watches are also utility items and these can be mounted on a table. We also offer these watches to the clients at industry leading prices and in different designs.